Available in English and Indonesian. BP's Tangguh Liquid Natural Gas (LNG) project in Bintuni Bay is one of the latest in a long history of natural resources exploitation projects in the western half of the island of New Guinea. However, it can be argued that this project is particularly significant because it is opening up the region to a whole new wave of exploitation. Just as Freeport-Rio Tinto’s hugely profitable gold and copper mine has attracted more mining companies to Papua, so Tangguh is drawing in other oil and gas companies. The world's appetite for energy is increasing the pressure on the people and environment of Papua. The scale of the Tangguh project, together with the income it is generating from the sale of LNG to foreign markets, is further exacerbating this pressure. Since 1997, when the US based company ARCO announced the discovery of extensive gas reserves in Bintuni Bay, the pace of natural resources exploitation in Papua has stepped up. Against the backdrop of the Asian financial crisis, the fall of Suharto and growing political troubles in Papua, more and more Indonesian and foreign companies have sought to profit from these resources. As well as its minerals, oil and gas, Papua’s forests have been a major target for exploitation. Loggers have stripped vast areas of forest of their commercially valuable timber and oil palm and pulpwood plantation developers are following close behind them. There are now ambitious plans to develop food and energy crops in Merauke, in the south of Papua. Global concerns about climate change have prompted a recent focus, too, on the potential profits to be made from conserving carbon stocks in Papua’s remaining forests. The influx of people from other parts of Indonesia has provided labour for these industries and has fuelled socio-economic changes in Papua. Meanwhile political tension continues over the failure of Special Autonomy, introduced by Jakarta almost a decade ago to counter demands for independence. Special Autonomy has failed to lift the majority of Papuans out of poverty or to give them a voice in decision-making about how they are governed and how their rich natural resources are managed in future. This is the context for BP's Tangguh LNG project, located in Bintuni Bay district, in the province of West Papua.The main project site is located on the southern shore of Berau Bay, to the south of the "Bird's Head" peninsula of West Papua. The district was demarcated in 2006 and consists of 11 subdistricts and 97 villages. Its covers an area of 18.658,00 km2, with a population of 48.079 people. Residents of the area are indigenous Papuan peoples and people from outside Papua settled under Indonesia’s state-sponsored transmigration programmeas well as other settlers. The indigenous Papuan population of the Bay consists of seven groups: Irarutu, Wamesa, Sebiar, Sumuri, Kuri, Soub, and Moskona. The livelihoods of indigenous peoples of this region are mainly hunting, gathering and fishing. The geology of the Bay means it is relatively rich in minerals, oil and gas. According to BP, the Tangguh concession holds the rights to 14.4 trillion cubic feet of proven gas reserves, with possible reserves of 24-25 trillion cubic feet. The Tangguh LNG project has rights to three concession blocks: Wiriagar, whose contract term runs to 2023, and Berau and Muturi, whose contract terms run to 2017 and 2022 respectively. To process the gas, BP Tangguh has built a LNG plant on a 3,500ha site in Babo District. The total capital investment for the project, which is expected to run for at least 20 years is around US$ 5 billion. Development of the Tangguh project has involved the relocation of a whole village – Tanah Merah Village - to make way for the LNG processing plant, plus the acquistion of land belonging to three clans of the Sumuri indigenous groupwho are the customary landowners in the area: the Soway, Wayuri and Simuna BP has built a new resettlement village for the community displaced by the LNG plant, called Tanah Merah Baru (New Tanah Merah). Construction started in February 2003 and the new village was officially 'opened' on July 17, 2004. There are also nine villages which have been designated as ‘Directly Affected Villages’ (DAV) by the project, which are the target of BP's 'community action' programme and ‘development’ funds. For the first two years, BP supplied the residents of the resettlement village with electric lighting, clean water, health facilities and food. Now, there are reports that some residents, especially fisherfolk and farmers, feel as if they have been discarded. They have no communal land to farm, while the women of the villages who used to capture shrimp on the beach are now prohibited from doing so. Public facilities, such as clean water which was once abundant, are now are often intermittent. Electricity is only available at night. The local community health clinics set up by BP are more often closed than open, because doctors and paramedics are usually in Bintuni town. The social programme has not materialised as originally promised by BP. However, reports say what most angers people is that employment opportunities for local Papuans are very limited. The most young local people can expect, for example, is to become security personnel for the project. To address these problems, pressure needs to be applied to BP to ensure that the company delivers on the assurances the company has given to local communities around the Tangguh project. DTE’s compilation of information on BP’s commitments to environmental and human rights standards at Tangguh, aims to contribute to broader efforts to strengthen the local community’s own capacity to hold BP to account. Since 1997, DTE and others have repeatedly expressed concerns over the sustainability of the BP Tangguh project and the human rights, social and environmental concerns it creates. In 2001, DTE highlighted community demands for compensation, concerns about the project’s future impact on mangrove forests in the Bay, and the implications for the project’s security arrangements of a brutal police operation against local people in neighbouring Wasior district.The following year we reported how local people had mounted a day-long occupation of BP’s base-camp, while local NGOs called for a moratorium on the project. In 2005 we highlighted a letter to BP from Simuna, Sowai and Wayuri clans and joined 300 NGOs and individuals in signing a letter to BP’s then chief executive John Browne, calling for a halt to the project until wider concerns over human rights and the wider political context had been addressed.We also translated a report by a local NGO activist about the human rights implications of Tangguh. DTE has also regularly attended annual meetings with the advisory panel set up by BP (TIAP) to address these concerns to the company directly. In 2009, for example, we accompanied a representative from a local Papuan NGO to the TIAP meeting, as well as raising the issue of wider compensation for communities on the north shore of Bintuni Bay. 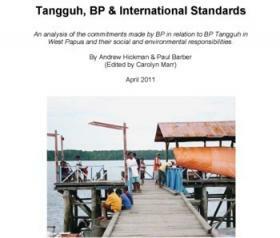 In March 2011, in consultation with partners in working in West Papua, we raised those grievances again, as well as growing concerns about the impact of BP Tangguh on local communities. Despite the calls for a halt to the project, Tangguh has gone ahead and is now fully operational. Gas is being extracted from under Bintuni Bay and processed into LNG to be shipped out to markets in China, Korea, the US, Mexico and elsewhere. Precisely if or how local communities will benefit in the long run from BP Tangguh's presence remains to be seen. In the meantime, DTE believes that local communities will have a stronger basis to press for social and environmental accountability from BP if they have access to fuller information about the commitments BP has made to them. This was created in 2003 when Papua was split in two in a controversial move pushed by the Jakarta government. See DTE Special Report on Transmigration for background. See DTE Newsletter 65, May 2005. See Introduction to BP Standards document. See Statement by Soway, Wayuri & Simuna tribes, DTE Newsletter 65. See DTE 49, May 2001 and DTE 50, August 2001. See DTE 53-54 August 2002. See DTE 65 (i), May 2005 and DTE 65 (ii).